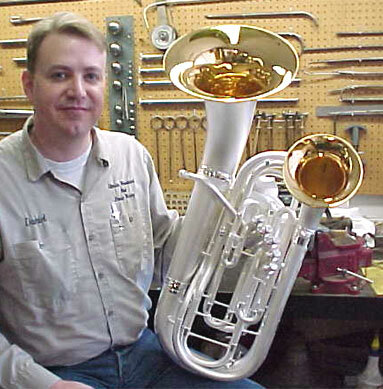 This is an old De Vries saxhorn/euphonium from a customer in Arizona. This was a challenge to work on as the metal was quite thin and worn. It turned out beautiful and the owner loves to sit on his porch and serenade the neighborhood! 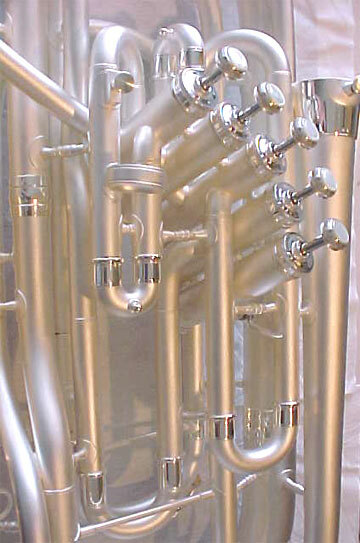 Here is a marching baritone bugle with two valves. It had been well used in drum corps during the owner's youth. As he was now returning to playing in an adult corps, he wanted his horn in top condition. Steve spent quite a bit of time removing all the dents and scratches. We put a durable bright silver plate finish on this, it should really stand out on the field! 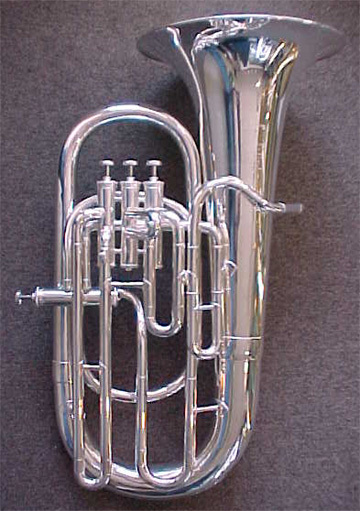 This Conn Double Bell Euphonium came into us after several years of sitting. This horn had been in the customer's family for generations and they felt it was ready to be restored to it's former glory. We completely redid this beauty into a satin-silver finish with bright silver highlights and gold plated bell interiors. The serial number dates this as manufactured in 1928! (Don't we all hope we look this good at 75 years old!) The valves were rebuilt, the horn was completele dismantled down to the smallest piece. Broken or cracked parts were ground, silver braised and dressed. The mouthpipe was replaced with a custom fabricated mouthpipe and all of the polishing, masking and texturizing was performed in-house. Check out the details in the above picture! It really did take as much work as it looks! One of our customers was involved in a construction accident, and lost part of her middle finger. 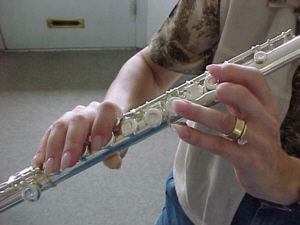 This left her unable to play the flute, as her finger could not reach the A key. We were able to build a detachable A key adapter, which is designed to be removed to allow easy servicing in the future. 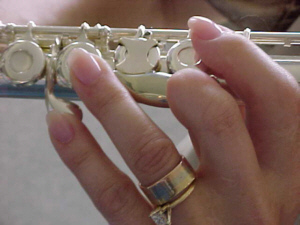 Due to the nature of flute key action needing to be feather light, the weight of the touch point required it to be hand-forged out of rigid sterling silver about the thickness of an egg shell. This kept the weight down and allowed the action to be properly maintained. Occasionally, an opportunity to make a difference in someone's life comes along. Oberloh Woodwind and Brass Works recently had the opportunity to help a young woman, Jessica Mitzel, explore the world of making music. 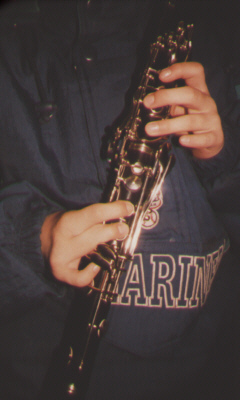 Oberloh Woodwind and Brass Works was able to modify this clarinet so that she could play it with less than 10 fingers. 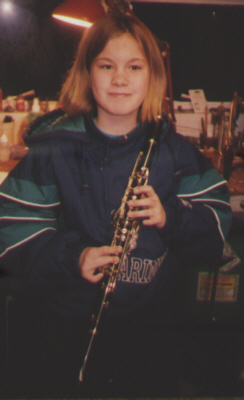 However, the work done on this clarinet is nothing compared to the work of her plastic surgeon, Dr. Almquist of Children's Hospital, who was able to reconstruct much of her hand. 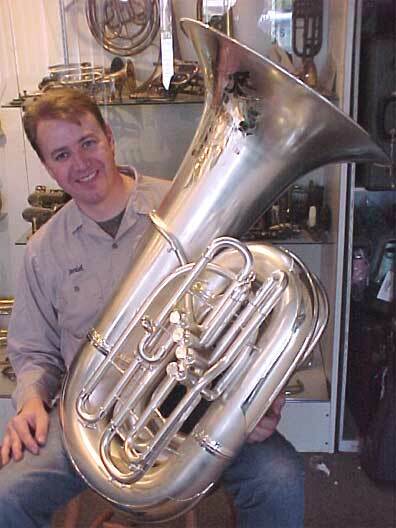 This Karal Ziess tuba was incinerated in a building fire in 1981. Dan was able to restore it to prime condition. 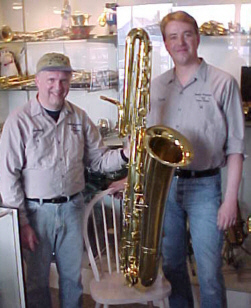 One of the most difficult projects we have completed was this instrument pictured above, as Dan and Steve pose with the 1919 Conn Bass Saxophone. This project took nearly a year to complete. This particular instrument was acquired for us by one of our buyers in Delhi, India. Considerable negotiations were required to achieve the acquisition of this fine instrument. Originally in silver plate, we found the plated finish to be severely damaged and not economically feasible to restore. It was decided the instrument would be refinished and a gold lacquer applied. One man's trash is another man's treasure. This 100 year old J.W. 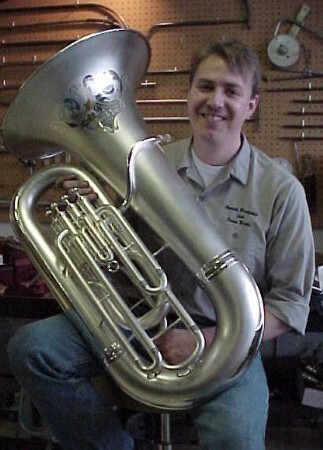 York and Sons EEb tuba was brought to us in as bad a state as can be imagined. Having been used as a flowerpot, the instrument was recovered and brought to our shop to see if restoration was possible and feasible. 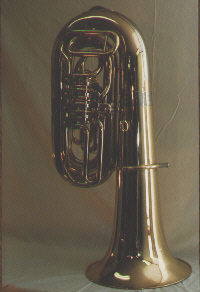 This instrument required rebuilding all four valves, fabricating a custom mouthpipe and receiver, several braces and a new fourth valve branch assembly and tuning slide. The upper branch had over 130 cracks, all to be silver braised. The bell was re-engraved and the whole horn was plated in satin silver with bright overlay. The answer to the customer's original question as to whether it could be restored? Yes! 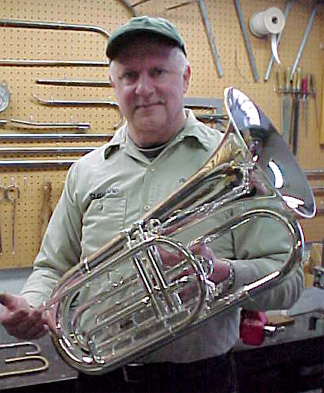 Upon his retirement from performing, the owner, Mr. Ron Munson, has decided to donate this magnificent instrument to the collection at the Shrine to Music in Vermillion, South Dakota.